This recipe was given to my daughter many years ago. Enstrom’s toffee is world renowned for being the best in the world. We are honored to have this recipe and share it with you! It will cost you about $7.50 for butter, sugar, chocolate and almonds to make this recipe. 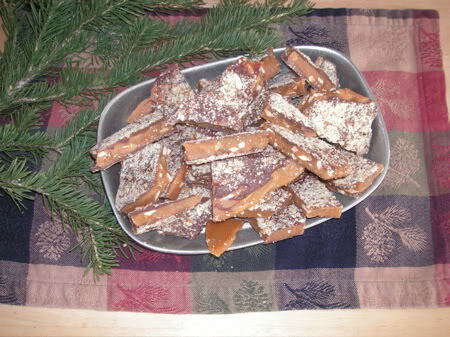 The finished recipe makes about three pounds of toffee, enough for several generous gifts. Melt butter in a medium sized sauce pan – about 3 quart size over medium to medium high heat. Add the salt. When the butter is almost melted, add the sugar in quickly. Stir slowly, using a figure 8 motion with a wooden spoon. The sugar will not immediately dissolve or mix in, this is normal. When the sugar absorbs into the butter the mixture will look more homogeneous and smooth. This takes 5-10 minutes. Then add the slivered almonds. 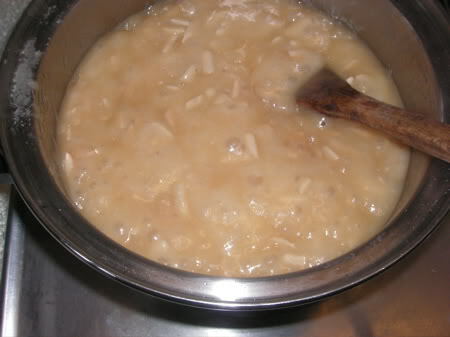 This is what it will look like when you add the almonds. A would call this the blonde stage. Continue to slowly stir the mixture in the saucepan for about another 10-15 minutes until the mixture reaches the hard crack stage. This is 290 ° F on a thermometer. (I use the instant read thermometer with a probe which I also use for bread.) You will notice that the sugar mixture is turning a darker more caramel color and it is almost starting to smell like burnt sugar. You can also drop a small amount of the mixture into iced water to test for the hard crack stage. Do not under cook. This picture shows how much darker the mixture becomes. If the mixture has reached 290 or hard crack, pour the mixture onto a large cookie sheet and allow it to spread out. Place the cookie sheet on a cooling rack NOT ON A COUNTER because the mixture is so hot it could warp your counter. 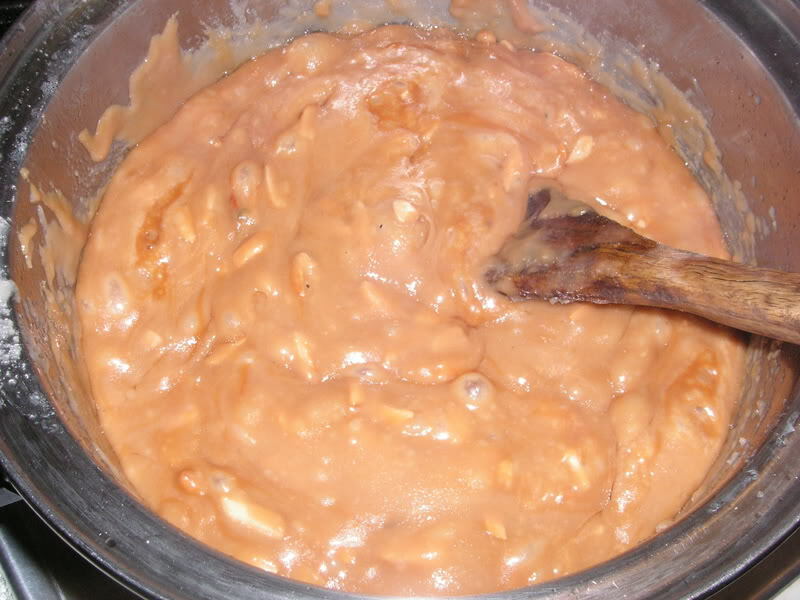 After the toffee hardens, about 30 minutes, melt half the chocolate chips in a double boiler and spread over the toffee in a thin layer. Sprinkle with finely diced almonds. When this is cooled, flip the toffee over and repeat. Spread the other half of the chocolate chips, melted over the toffee and sprinkle with finely chopped almonds. 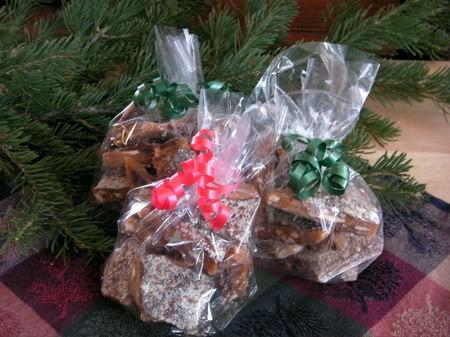 When it is totally cooled, put portions into cellophane bags tied with a ribbon to use for gifts. Just made this, it looks great! How long does it take for the chocolate to set to be able to turn it over? It has been about 45 minutes and even tho the toffee is cool the chocolate is still to soft to turn. Thanks! I finally got up the courage to make this the other day. Don’t know why I was worrying! Very simple and turned out perfectly! 1st time I ever made candy too! By sheer coincidence I took some to Thanksgiving dinner at relative’s home and they had some Enstrom’s they have just bought online so we were able to do a side-by-side taste test. Mine (this recipe) won hand’s down. Everyone said it tasted more buttery. I thought so too. At any rate, I made 3 1/4 lbs for about $10 instead of $19 + shipping for a pound. Thanks for the recipe. It’s already getting passed around. Thanks for this recipe. I loved Enstrom’s toffee, too. But it is very expensive. So hopefully, this will be as good. Will try dark chocolate though.